It’s been centuries, kitchen always been ignored. Even though you get attention it, still become the last priority after living room and family room. A dirty and worn out kitchen make the entire house not cheerful and spiritable. Kitchen often be the smallest room inside the house and located in the corner. If the house that you’ve been bought has already been like this, don’t be lose heart. Even it’s small, kitchen still can be stylish. Let’s scrutinize this next small kitchen. Not a bit women reluctant entering kitchen just because they feel the kitchen uncomfortable for working. Until now, we still can found a kitchen in condition just like this even in a luxurious house. Designing a kitchen should consider the location, put the utensils and appliances in an appropriate place. So it would not disturb you when cooking. Design the kitchen with nice appearance, so we feel comfortable to stay for long time. 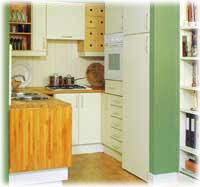 This picture show a very small kitchen, but the owner can organize the kitchen so that this mini kitchen look nice. The cabinets are only in one side of the wall. That’s why plates not placed in the cabinets so that kitchen utensils such as pan or wok can be placed inside those cabinets. Plates and other utensils for eat were store in glass cabinet that adhere next the kitchen cabinets. This glass cabinet become a lovely screen or partition between kitchen and the other room. Want a little sweet touch for your kitchen? Look at the shelf! There are three shelfs at the corner and made in different size. It’s only a small idea but great, right? Kitchen under the stairs? Why not! If we have to make this space as a kitchen, no problem! Let’s see how to organize it. 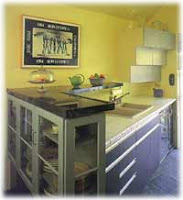 Design your kitchen like letter L. The space is alloted, we can’t give many decorations and install wasteful cabinet. Just make a simple cabinet (see the picture), and let the shelf opened to the air (no door). We can put couple utensils inside which also become as decoration. Remember, don’t put many stuff in this shelf. You can paint your kitchen in two colors. Soft light color is better than a glaring color. 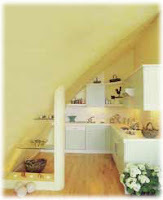 You can also add a small shelf in this room with medium altitude. You can put a decoration or use it as an entrance to the kitchen. Our next kitchen, is a small kitchen too. Design the cabinets just like letter U. Because the space is very limited, There is not enough space for chopping or put dishes which has been wash. For solve this problem, the owner add a board next to the sink. When you want to use it, you just raise it, when it’s done, fold it back. Pay attention to the color combination, between, white, green and the wood and all the decoration. Remember, lovely kitchen is not depends on how many decoration you have! You can use these three kitchen as a sample and model, adjust it with you own purpose and desire. Don’t let your kitchen messy and dirty place. But, make the kitchen as a pleasant place to cook and serve a luscious servings you’re your lovely family.